Recombinant monoclonal antibody to p53. Manufactured using AbAb’s Recombinant Platform with variable regions (i.e. specificity) from the hybridoma PAb421. Immunogen: Synthetic peptide corresponding to aa 371-380 of human p53. Specificity: Recognises the mammalian mutant and wild-type p53 protein and reacts with an epitope between amino acid residues 370 and 378 (near the C-terminus of the protein). Note on publication: Describes the production and subsequent characterisation of anti-p53 monoclonal antibody clones. Flow-cytometry on Jurkat cells using Ab00142. Flow-cytometry using the anti-p53 antibody PAb421 (Ab00142) Jurkat cells were stained with unimmunized rabbit IgG antibody (black line) or the rabbit-chimeric version of PAb421 (Ab00142-23.0, blue line) at a concentration of 10 µg/ml for 30 mins at RT. After washing, bound antibody was detected using anti-rabbit IgG JK (FITC-conjugate) antibody (129936) at 2 µg/ml and cells analyzed on a FACSCanto flow-cytometer. Western Blot on A431 cell lysate using Ab00142. 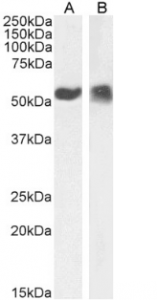 Western Blot using anti-p53 antibody PAb421 (Ab00142) A431 cell nuclear (A) and cytoplasmic (B) extract (35µg protein in RIPA buffer) was resolved on a 10% SDS PAGE gel and blots probed with the chimeric rabbit version of PAb421 (Ab00142-23.0) at 0.1 µg/ml before detection by an anti-rabbit secondary antibody. A primary incubation of 1h was used and protein was detected by chemiluminescence. The expected band size for p53 is 43.7 kDa, though due to the high number of proline residues in this protein runs at a size of ~53kDa (c.f. Ziemer et al., PMID: 7107651). Ab00142-23.0 successfully detected both human nuclear and cytoplasmic p53. IF staining of A431 cells using Ab00142. 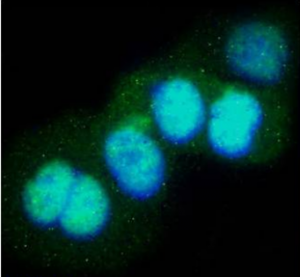 Immunofluorescence staining of fixed A431 with anti-p53 antibody PAb421 (Ab00142) Immunofluorescence analysis of paraformaldehyde fixed A431 cells, permeabilized with 0.15% Triton and stained with the chimeric rabbit IgG version of PAb421 (Ab00142-23.0) at 10µg/ml for 1h followed by Alexa Fluor® 488 secondary antibody (1ug/ml), showing nuclear staining. The nuclear stain is DAPI (blue). 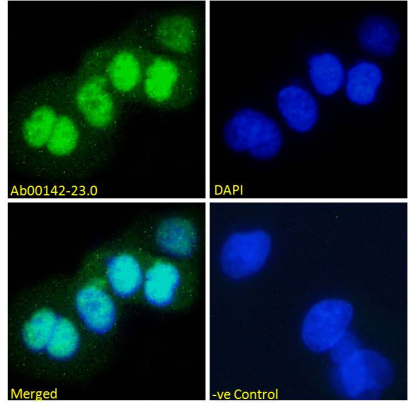 Panels show from left-right, top-bottom Ab00142-23.0, DAPI, merged channels and a negative control. 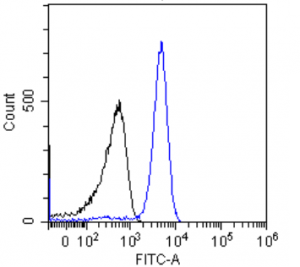 The negative control was stained with unimmunized rabbit IgG followed by Alexa Fluor® 488 secondary antibody.